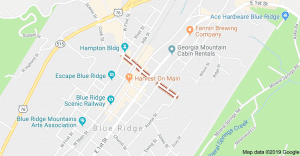 BLUE RIDGE, Ga. – Mountain Street in downtown Blue Ridge will be closed Wednesday and Thursday starting at 8:30 a.m. due to the city completing repairs in the area which were begun last week. The City of Blue Ridge will be finishing repair on the Mountain St sewer line Wednesday April 10 and Thursday April 11. A portion of Mountain St. from the intersection at East Main to the intersection of West Main will be closed starting at 8:30 am on Wednesday. While we understand this is has been inconvenient, the repair work is a necessity. The same traffic control plan as last week will allow access to all businesses and Roberts’s way should remain open during this process. Please communicate with your staff, customers and delivery people. Safety of the crew and people on the road is the first priority. We encourage travelers using Mountain St to cut across town to take an alternate route during this time. 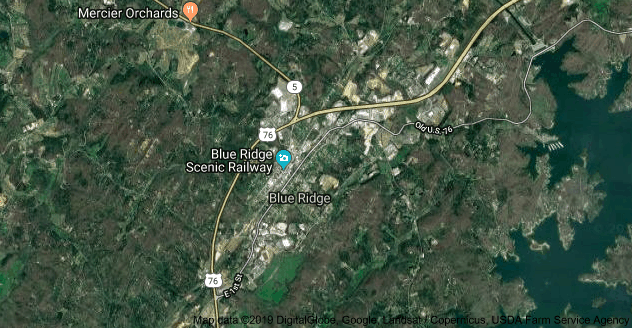 Mountain Street – Downtown Blue Ridge Ga.
Traffic will be allowed to enter Roberts Way from the West side as long as it does not interfere with the safety of the crew or travelers. The one way portion of East Main St will be turned up Mountain St to East First. Travelers on East Main between Davis St and Mountain St will be allowed access to those businesses but through traffic will be routed around to the City parking lot to exit on Mountain St and must turn toward West First St. The Spa store and Tru Fitness will be accessible from the west side where public parking is located via the detour off of East Main into the parking area and must exit via Mountain St toward West First.